This is the lightest blue vitreous glass tile in this range, matching with the lightest of the three colours in the Luna mix. Each tile is 2cm x 2cm x 4mm and has a flat face with a slight bevel on each side. The back of every tile is ridged. Boxes of this lightest blue vitreous glass mosaic tile contain 10 sheets of 225 separate tesserae that are held together on a plastic mesh. Each tile is 2cm x 2cm square and 4mm thick. There is a total of 2,250 individual mosaic tesserae per box. Each box covers an area of approximately 1.07 square metres / 11.51 sq ft. 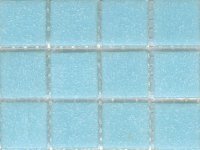 Sheets of this lightest blue glass mosaic contain 225 separate mosaic tiles in a 15 tile by 15 tile grid, with the tiles held together by plastic mesh on the back of the tiles. Each tile is 2cm x 2cm square and 4mm thick. Each sheet covers an area of approximately 0.107 square metres / 1.15 sq ft. Sheets of this lightest blue glass mosaic contain 225 separate mosaic tiles in a 15 tile by 15 tile grid, with the tiles held together with paper bonding on the face of the tiles. Each tile is 2cm x 2cm square and 4mm thick. Each sheet covers an area of approximately 0.107 square metres / 1.15 sq ft.
Did you know that the word 'mosaic' means 'patient work of art, worthy of the muses'.